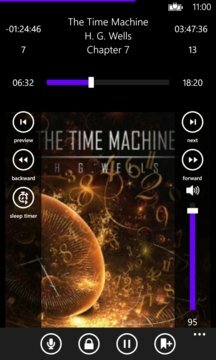 Digital Audio Book is a simple and convenient audiobook player. It keeps track of current book, last position in the book, and supports bookmarks and sleep timer functionality. 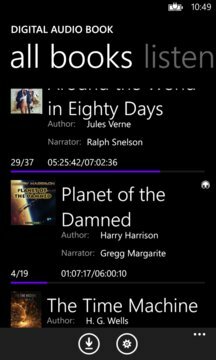 When using a local server to download, you decide how the book will look in the player. If in chapter 18 there is a map of caves, just add this map image to 18th chapter. If the second chapter begins with a verse, add it to the description of the chapter. Combine sounds, images and literary texts.